The Greatest Gift didn’t arrive wrapped — except for a tangled web of memories and gossamer wisps of uncommon frames of reference. Had someone tried to wrap this gift, it would have been a crazy quilt mish-mash of paper designs; unique snapshots of growing up as one of The Burns Girls. I suspect this picture hales from the day M. Viola Stern and Wilmer F. Burns got either engaged or hitched. It couldn’t have been from much later because Mom has no baby bump. During the early years, they lived on and worked dairy farms. I call those the begetten’ years. Four babies in four years and seven months? Four years passed before baby sister, Sheri, came on scene to complete The Burns Girls. Coincidence that Dad switched years earlier to long-haul truck-driving? Mom and Dad are gone from view, but remain alive in memories and hearts — especially for The Sisterhood. HURRY OR WE’LL BE LATE FOR CHURCH! SAY CHEESE(y hair)! This has to be a pre-church picture. We have curled hair, and we’re crammed on one chair with no evidence of mayhem. She gave me the greatest gift via a save-the-date postcard featuring that long ago picture of Mom and Dad. She gave me the chance to reconnect with my sisters on a “we shared one bathroom and two bedrooms for crumb’s sake (! )” level. The Burns Girls Family reunion set the stage for unique and special reconnects. I plan to feature each of my sisters as soon as they do something stupid for me to blog about over the next few months. 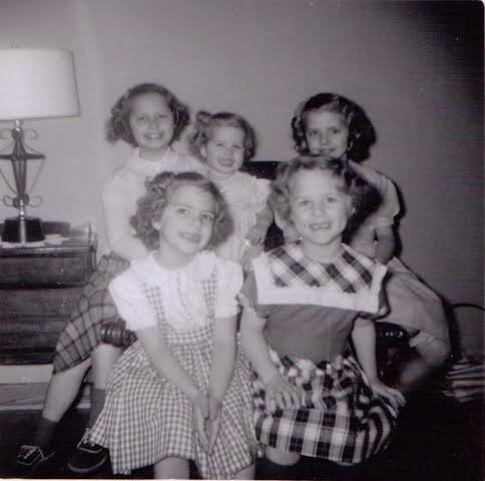 Today, meet looks-like-trouble Sandy (front row, right). Some find ‘out-moxie-Gloria’ freaking scary. Me? I was creatively sneaky, and hid behind cover stories. Sandy put it all out there, and to heck with the consequences. When I left for college, Sandy took over my fake babysitting job. She did not prearrange fake calls from “Kaye” when Mom would overhear. She did not save her lunch money as proof of payment for the gig. She did not make her friends turn off interior car lights or wear a babushka when they Kaye picked her up. Nope! She marched out of the house unprotected by back-up fibs. I gave her that gig, but had no part in others. For some reason [*rolls eyes toward ceiling*] Mom once issued an edict banning friends at the house unless she was home. She worked late and didn’t get home until 9:00 three nights a week. Dad? Away hauling freight (if we were lucky). Willie (front left in picture) argued against how unfair (!) it was. Sandy listened. Willie: We only play badminton. What’s wrong with that? Sandy! Why aren’t you helping me? Sandy: Why bother? She works late. She won’t know what we’re doing. Mom’s rule died the same speedy death as the tiny hourglass timer Dad put by the phone so we could self-police his dictated time-limit-per-call. On the way home from school, a friend on the school bus spotted our family station wagon. Friend: That’s your car! Who’s driving? Sandy was not old enough to drive. In Sandy’s defense, Willie — prone to “my-brain-farted” car accidents — called home for help after yet another one. Sandy was home alone. No stupid permit to drive overrode a rescue mission. Aside from being a hoot and a half, Sandy is a friend magnet. Over the years, I’ve adopted some as my own. Should I ever relocate to a new locale, I would have Sandy visit to build the new friend network. Like all my sisters, I know Sandy will be there if I need something. That said, I have a unique bond with each of them. If forced to choose one word to describe my bond with Sandy? Two words? MISCHIEF AND MISHAPS. This is an all-grown-up picture of Sandy at the lake house we once had. 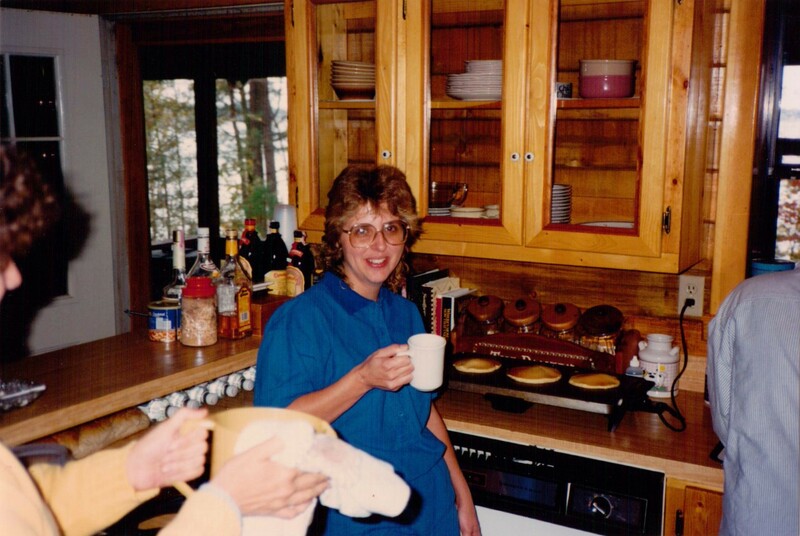 One morning, when we made breakfast for family and friends, Sandy cleaned blueberries at the sink. I mixed pancake batter at the stove. Me: Stir, stir, stir. Clean lots of berries. Sandy: What should I do with the stems? Sandy tossed those ‘lots of blueberries’ into the batter. Minutes later, we added beautiful, buttery, blueberry pancakes to the breakfast buffet. Nephew: These pancakes are good, but you should have taken the seeds out of the blueberries. Me: Blueberries don’t have seeds. Another traitor guest: I found some in mine, too. Sandy and I slinked to the sink. I spotted the stems. GULP! Our guests had purple grape pancakes. For a wee bit, Sandy and I debated destroying the evidence and letting small children grow up thinking blueberries had seeds. I never pre-book hotel rooms. I never know how far I’ll want to travel. For the 1319.3 mile drive from my house to our Burns Girls Family Reunion, Sandy was my travel agent — room bookings, routing advice, Google searches for the closest Starbucks. I left the house at 9:00 in the morning, and called Sandy at 4:00 p.m. for help with my destination. Me: I need to know where I should be at about 6:00 tonight. Sandy: Where are you now? For those unfamiliar with Texas/Oklahoma: Ardmore is precisely 93.1 miles from the house I left 7 hours earlier. I do not drive 13.3 MPH. Most sane people would have asked silly questions: Are you okay? Did you get sick? Were you in an accident? Did the car break down? How much is your bail? Sandy: HAHAHAHAHAHAHAHA! You stopped at the WinStar. Me: I had to pee. WinStar has restrooms. Sandy: So. You gambled for 6 hours? Me: Three. But, I was tired, so I took a nap in my car. Me: I’m a grand richer. Sandy: YAY, you. How far are you going tonight? God bless her like-minded conniving little heart. She calculated times and mileage and gave me my pretend destination for the night. Three weeks after a glorious month in Pennsylvania, Sandy asked if I wanted to take a road trip to Laughlin and then Vegas, Nevada. On Freemont Street in Vegas, I finally, finally out-moxied her. 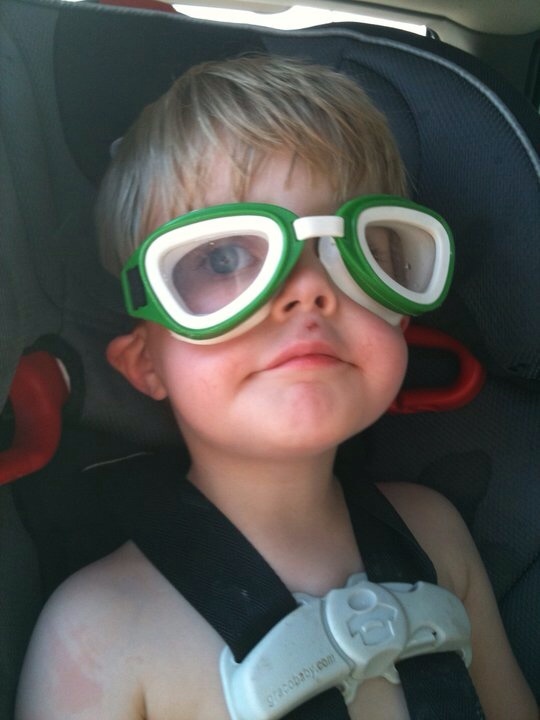 Sandy spent the rest of the trip wearing the fashion-forward style of her grandson. QUESTIONS? COMMENTS? Did you come from a multi-sibling family or wish you had? Were you into random acts of criminal behavior as a young-‘un? If yes, spill. Details! We want details. [Unless the statute of limitations doesn’t yet protect you.] Does the post on Jenny’s site make you want your own Undie-Venture? Say something. Anything! I do my best work in comments.